Websites are valid HTML5 code which meets the best SEO practices. 100% compatible with industry-leading SEO practices. Websites are tested for compatibility with the most popular browsers and functionality: WooCommerce, WPML, Contact Form 7 and others. Increase visibilty, to gain more return on your investment! with the best people who have the talent,staffs and experience to give you superb design that will put you on the highest pedestal. 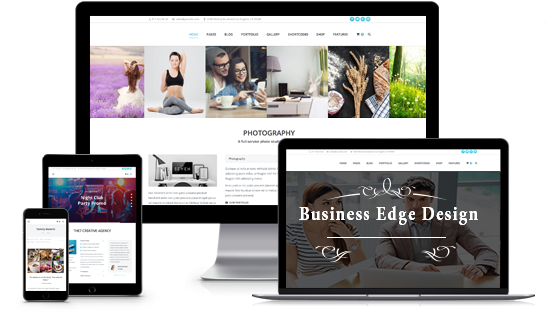 Business Edge Designs is from a marketing background which means that we don’t just provide you with a great design but we can create or restructure your brand’s identity to target the right market and to stay above your competition or to be on the same level as those big corporations. Our guaranteed services we provide are listed below, if you don’t see any particular service feel free to give us a call and inquire if it has to do with design, animation, photography or social media marketing. At Business Edge Designs we are dedicated to provide you with a fresh perspective with your company branding. Our staff is dedicated to provide you with consultations in a variety of business markets and fields. All of our professionals strive to help you individually and your unique business; by achieving your business goals, improving the efficiency of your business operations, increasing profitability, success and long term financial stability and growth. Business Edge Designs prioritizes customer service and satisfaction. I was very pleased with their services and would certainly recommend this business to anyone who needs to get the job done. Business Edge Designs has definitely exceeded my expectations with my website development. The design is well crafted and put together. They researched my competitors within my area and planned the design tailored towards my industry. Here are a few of our samples, If you see something you like just bring it to our attention and we can implement it into your design. Business Edge Designs specializes in a variety of branding design concepts for your business. If you do not see what you specifically need feel free to contact us with an inquiry. You need a dynamic website. It should engage the audience or the visitors in real time.The website design must be responsive so you can have a presence on mobile platforms as well. Targeting desktop and laptop browsers wouldn’t be enough. You must be accessible through mobile searches on smart phones and tablets. to come to us. We can create 2-3 versions of your design depending on the requirements and the budgeted time and do the best we can. We are artists with your perspective in our vision. If your looking for something specifically sketched out we can draw it as well and digitalize the graphic for the computer to print or advertise on the web. Search Engine Optimization techniques has played an indispensible role in the constant growth of various firms and companies. This is because this strategy makes websites achieve the highest rankings in major search engines. These websites possess a conspicuous potential in marketing the products and win over the minds of millions of people. This also enables an organisation to expand. Marketing Planning is a system of analyzing potential marketplaces in order to determine whether a business can realistically operate in that sphere. The information garnered in the market planning process will then be used to create the marketing strategy, which will be implemented to enhance sales.. Without a rigorous marketing strategy, potential customers will not be aware of the service your business provides. This is vital because planning how you’re going to reach potential customers helps to ensure a perpetual stream of business. Photo editing is essential for your post photo sessions. You can enhance a photo graphically, you can add special effects, you can remove blemishes, you can create alternate versions of the same photo and you can also work on an array of aesthetic features. From cosmetic enhancement to truly enhancing the resolution, making the image sharper and more engrossing, photo editing is a magic wand that empowers you. There is no reason why you should not consider photo editing.